Public hearings have been scheduled to discuss an integrated aquatic management program at Manchaug Pond to monitor, assess, and implement measures for control of non-native/nuisance aquatic vegetation, with a toolbox of methods from winter lake-level drawdown, to benthic barriers, hand-harvesting and Diver-Assisted Suction Harvesting to U.S. EPA/State registered aquatic pesticides including herbicides and algaecides. Sutton Conservation Commission: continued to October 3rd with Order of Conditions expected. Continued from September 19th, August 15th, July 18th, June 6th, June 20th, Sutton Town Hall, Uxbridge Road, Sutton. View at Sutton TV Online. Douglas Conservation Commission: closed August 6th, after hearing on July 16 since unable to do so on June 18th, Douglas Municipal Center, 29 Depot Street, Douglas. View online Douglas YouTube. 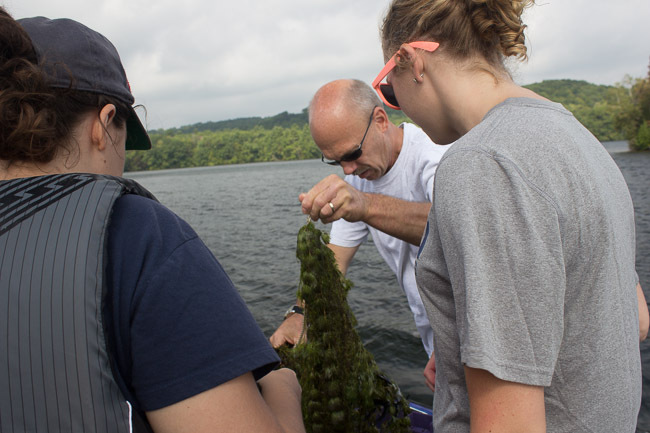 On the two target non-native plants, Variable Milfoil and Fanwort, visit the No Invasives! website page. Click on the photo for more information. To watch the presentation before the town of Sutton Board of Selectman by the MPF President, Treasurer and Corresponding Secretary. To view a Diver Assisted Suction Harvesting boats in action on another lake, visit Manchaug Pond’s YouTube Channel DASH Playlist. On winter lake-level drawdown visit the Waterlevel & Dam website page. concerning the use of pesticides (herbicides and algaecides) – direct to Board member William Langlois who is spearheading the initiative with Solitude Lake Management. development of a new Diver-Assisted Suction Harvesting program/boat for Manchaug Pond – direct to Treasurer Edward Biehn who is researching and developing with President David Schmidt in order to vacuum out specific problem weed plants/beds at your waterfront and dock. to volunteer or observe the MPF Aquatic Plant Survey Teams in action in August – direct to survey team member William Langlois. Thank you as always for your support, time and membership in the Manchaug Pond Foundation. If you haven’t… join as a member, renew, donate to a cause, and volunteer today!